My Mom, Betty has been working on some charity quilts. She sends them to me for quilting. This is another one and I thought I would do the spirals on it. You can see it is a log cabin type quilt. I am not sure but I think it is the Pineapple Blossom pattern from Bonnie Hunter at Quiltville. We belong to two quilt guilds. 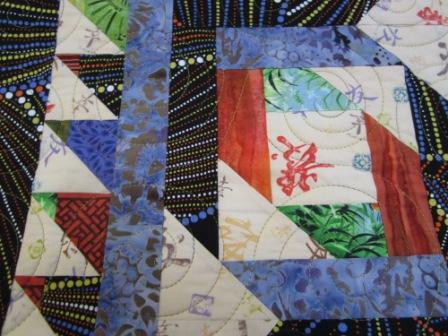 The Leduc Black Gold Quilt Patch and the Edmonton and District Quilter`s Guild. They both have great Charity projects underway. I am not sure were this quilt will be going. Mom has four or five quilts for charity on the go. I did another one before Christmas, an eye spy baby quilt but I forgot to get a photo, maybe next week before she gives it away. Thank You all for the comments. I love them. It keeps me sharing if I know you are out there looking at my quilts. I love to share my work. I joined the quilt guilds because the show and share or show and tell is the best part. Great quilt - the quilting design really enhances it. Love the fabric choices too! Show and share is indeed one of the best parts of the guild. 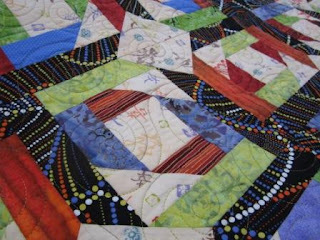 I love seeing what other quilters have created - there are so many talented quilters out there. 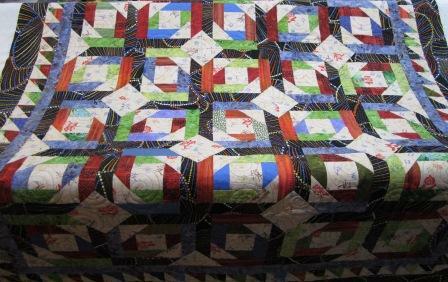 Your mom is one generous quilter- that is a fabulous number of charity quilts. It is equally nice that you will quilt them for her- how fun is that to make a quilt together. They will indeed be lovely works for some great causes.